Sacramental bread, sometimes called altar bread, Communion bread, the Lamb or simply the host (Latin: hostia), is the bread used in the Christian ritual of the Eucharist (also referred to as the Lord's Supper or Holy Communion, among other names). Along with sacramental wine, it is one of two "elements" of the Eucharist. The bread may be either leavened or unleavened (appearing as a wafer), depending on tradition. Roman Catholic theology generally teaches that at the Words of Institution the bread is changed into the Body of Christ (see transubstantiation), whereas Eastern Christian theology generally views the epiclesis as the point at which the change occurs. Some Protestants believe transignification occurs at the Words of Institution. The word "host" is derived from the Latin hostia, which means "sacrificial victim". The term can be used to describe the bread both before and after consecration, though it is more correct to use it after consecration. Prior to consecration, the term "altar bread" is preferred. The sacrifice of Jesus according to Christian theology puts an end to the need for animal sacrifice as had been practiced in the Jerusalem Temple and all blood sacrifice once-for-all. However the word was retained to describe the bread of Eucharist as a liturgical representation of the Christ's sacrifice. With the exception of Churches of the Armenian Rite and the Maronite Church, Orthodox Churches and Eastern Catholic Churches use leavened bread for the Eucharist. Thus, the sacramental bread symbolizes the Resurrected Christ. The hostia or sacramental bread, known as prosphorá or a πρόσφορον (prósphoron, "offering") may be made out of only four ingredients: fine (white) wheat flour, pure water, yeast, and salt. Sometimes holy water will be either sprinkled into the dough or on the kneading trough at the beginning of the process. Because leaven is symbolic of sin, the Armenian Catholic Church and the Armenian Apostolic Orthodox Church traditionally offer unleavened bread (although it is distinctively different from the kind used by the Roman Catholic Church) to symbolize the sinlessness of Christ. The baking may only be performed by a believing Orthodox Christian in good standing—having preferably been recently to Confession, and is accompanied by prayer and fasting. Before baking, each loaf is formed by placing two disks of dough, one on top of the other, and stamping it with a special liturgical seal. The prosphora should be fresh and not stale or moldy when presented at the altar for use in the Divine Liturgy. Often several prosphora will be baked and offered by the faithful, and the priest chooses the best one for the Lamb (Host) that will be consecrated. The remaining loaves are blessed and offered back to the congregation after the end of the Divine Liturgy (Eucharist); this bread is called the antidoron (Greek: αντίδωρον, antídōron), i.e. a "gift returned", or "in place of the gifts". The Byzantine Rite Eastern Catholic Churches (like the Eastern Orthodox Church) use leavened bread for Prosphora (the Greek word for Eucharistic altar bread). The Syro-Malabar Church and the Maronite Church have adopted the use of unleavened bread due to Liturgical Latinisation. A Host is a portion of bread used for Holy Communion in many Christian churches. 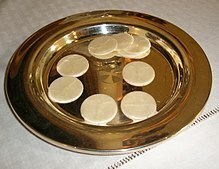 In Western Christianity the host is often a thin, round unleavened wafer. Roman Catholic unleavened Hosts for the Celebrant and wafers for the communicants. In the Roman Rite, unleavened bread is used as in the Jewish Passover or Feast of Unleavened Bread. The Code of Canon Law, Canon 924 requires that the hosts be made from wheat flour and water only and recently made so that there is no danger of spoiling. Hosts are often made by nuns as a means of supporting their religious communities. However, in New Zealand, the St Vincent de Paul Society hires individuals with intellectual disabilities to bake, cut out and sort the bread, thereby offering paid employment to those who wouldn't have that option otherwise. The General Instruction of the Roman Missal §321 recommends that "the eucharistic bread ... be made in such a way that the priest at Mass with a congregation is able in practice to break it into parts for distribution to at least some of the faithful. ... The action of the fraction or breaking of bread, which gave its name to the Eucharist in apostolic times, will bring out more clearly the force and importance of the sign of unity of all in the one bread, and of the sign of charity by the fact that the one bread is distributed among the brothers and sisters." In 1995 Joseph Cardinal Ratzinger, then Prefect of the Congregation for Divine Worship and the Discipline of the Sacraments, wrote a letter to the Episcopal Conferences in which he expanded the Code of Canon Law, stating that low-gluten bread would be considered "valid matter" for hosts as long as no additional substances "alter[ed] the nature of the substance of the bread". Since the 2000s, hosts with low gluten content have been manufactured in the United States, especially in parts of Missouri and New York. Hosts are one of the causes of lack of recovery for people with celiac disease who follow a gluten-free diet, which must be strict and maintained for life to allow the recovery of the intestinal mucosa and reduce the risk of developing severe health complications. 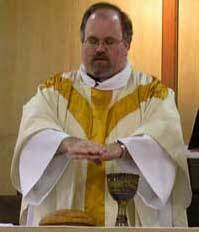 In the varying Protestant denominations, there is a wide variety of practices concerning the sacramental bread used. Some, such as the Christian Congregation use leavened loaves of bread, others, such as Lutherans, continue to use unleavened wafers like the Roman Catholics, and some use matzo. 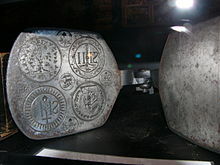 Reformed Christians use rolls which are broken and distributed to symbolize their belief that Christ is not physically present in their bread. Among those who use the unleavened wafers, there is a great deal of variation: some are square or triangular rather than round, and may even be made out of whole wheat flour. The Church of Jesus Christ of Latter-day Saints (Mormons) has no strict rules on the type of bread used for sacramental purposes. Latter-day Saint scriptures state: "For, behold, I say unto you, that it mattereth not what ye shall eat or what ye shall drink when ye partake of the sacrament, if it so be that ye do it with an eye single to my glory—remembering unto the Father my body which was laid down for you, and my blood which was shed for the remission of your sins." (Doctrine and Covenants 27:2) Different congregations may use either commercial bread or homemade bread prepared by members of the congregation. It is permissible to substitute rice cakes or other gluten-free breads for members who suffer from food allergies. The bread is broken into fragments just prior to being blessed by one of the officiating priests. In Bram Stoker’s 1897 novel Dracula, sacramental bread (referred to as sacred communion wafers) is used to ward off vampires. ^ "Altar Breads". vinnies-wellington.org.nz. Retrieved 18 March 2018. ^ a b "Low-Gluten Diet Alternatives Have Reached A New Frontier: The Catholic Church". ^ Ciacci C, Ciclitira P, Hadjivassiliou M, Kaukinen K, Ludvigsson JF, McGough N, et al. (2015). "The gluten-free diet and its current application in coeliac disease and dermatitis herpetiformis". United European Gastroenterology Journal (Review). 3 (2): 121–35. doi:10.1177/2050640614559263. PMC 4406897. PMID 25922672. ^ See JA, Kaukinen K, Makharia GK, Gibson PR, Murray JA (Oct 2015). "Practical insights into gluten-free diets". Nat Rev Gastroenterol Hepatol (Review). 12 (10): 580–91. doi:10.1038/nrgastro.2015.156. PMID 26392070. A lack of symptoms and/or negative serological markers are not reliable indicators of mucosal response to the diet. Furthermore, up to 30% of patients continue to have gastrointestinal symptoms despite a strict GFD.122,124 If adherence is questioned, a structured interview by a qualified dietitian can help to identify both intentional and inadvertent sources of gluten. ^ Wecker, Menachem. "Matzah Communion". American Jewish Life Magazine. Archived from the original on 2016-03-14. Retrieved 16 April 2017. ^ Benedict, Philip (2002). Christ's Churches Purely Reformed. New Haven: Yale University Press. p. 205. ISBN 978-0300105070. ^ Christianson, Thira. "Accepting Allergies". Friend. Church of Jesus Christ of Latter-day Saints. Retrieved 10 November 2011. ^ "COMMUNION AND THE SACRED WAFER". Retrieved October 14, 2018. Tony Begonja, Eucharistic Bread-Baking As Ministry, San Jose: Resource Publications, 1991, ISBN 0-89390-200-4.